The Prince George's County Government will be holding a public hearing on July 12th on a list of proposed speed camera sites. The list include 55 'established school zones' and 58 sites which are not currently designated school zones, but which would become school zones under the new plan. "The Maryland Annotated Code (TR § 21-803.1) allows school zones to be established within a one-half (½) mile radius of any school. However, not every road segment within a ½ mile radius of a school should be a school zone." and "Except in unusual circumstances and as justified by a traffic engineering study, a school zone adjacent to a school should not exceed 500 feet approaching or beyond the school or the school activity. Where that activity is a school crossing only, the school zone typically should end a short distance beyond the crossing." And that all such areas must be "established by official action by the entity that owns the highway containing the segment;" "appropriately signed in conformance with the MdMUTCD and guidance issued by the State Highway Administration"
The boundaries of the new school zones are not listed in the meeting documents. The list includes a school next to the locations, and do not give addresses for the schools or the bounds of the proposed zones. Because of that it is unclear whether they will be designating specific sections actually near schools as school zone (as they would certainly prefer the public to believe), or whether they intend to do what many Municipalities have been doing for their programs, simply "designating" all roads within 1/2 mile radius of any portion of any school facility as a school zone, including in some cases major commuter routes in places not accessible to pedestrians. It is interesting to note that the OLD VERSION of the SHA's ASE brochure included the sentence "School zones should not be established solely for the purpose of installing speed cameras." The SHA removed that sentence (over StopBigBrotherMD's written objections) when they rewrote the document (see new version), presumably either because most local government have not been complying with that anyways and have been creating vast new school zones solely for speed camera uses, or because they did not like the fact that StopBigBrotherMD has been quoting that statement. (We keep copies of most of the documents we reference on this site, because the documents tend to be changed or deleted out from under us). 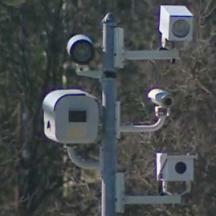 Should the proposed Prince George's County site list be selected as-is, then the majority of the county's speed cameras would be in locations designated as school zones solely for speed camera use. We previously reported that Prince George's County issued an intent to award their speed camera contract to Optotraffic (a division of Sigma Space Corporation). Optotraffic's cameras have been the subject of alleged errors as well as due process issues from citizens from Forest Heights who were unable to receive court hearings upon request(which Optotraffic is responsible for scheduling). Optotraffic/Sigma Space Corporation was a contributor to the county executive's campaign and inauguration fund. Under all of their existing contracts Optotraffic receives a percentage cut of each ticket in exchange for providing, maintaining, and processing violations from the cameras, as well as scheduling court hearings, mailing citations, and collecting payment. Police and local officials are involved in rubber stamping signing the citations, and also for signing the 'daily setup logs' which supposedly test the machines (but which in reality do not involve actual speed tests to validate the devices). The hearing on this list of proposed sites will be at July 12th at 1:30pm in the County Administration Building, 14741 Governor Oden Bowie drive Upper Marlboro, Maryland. The notice also states that another hearing within the next 30 days to discuss the selection of a speed camera contractor . We recommend that anyone who has issues with the performance of Optotraffic's cameras contact the county executive and county council prior to that time.